Rick Wood believes in the eight-second rule. If people can’t figure it out within eight seconds, they are going to give up. When it comes to public transportation, he believes society can’t afford to take that risk. Above: Rick Wood is the CEO of CHK America, a public transportation mapping service that is headquartered in Santa Barbara. Below: CHK America’s newly developed digital bus stops, seen above, are at 30 different locations throughout the country. So Wood has dedicated himself to inventing technology that helps people become mobile, reducing their fears around public transportation. While at the helm, Wood and CHK America has created the Digital Bus Stop, a wireless device that gives riders real time information about the location of the bus they want to ride. The company has 30 of the machines installed around the country. The Digital Bus Stop doubles as an environmentally efficient machine. It is wireless and powered by the sun. Inside is a battery back-up for those days or weeks of clouds. Software connects the transit agency’s bus route data with CHK’s proprietary screen, so that the device serves as a real-time information display. The screen, with a Kindle-like face, is different than a smart phone app that might estimate the bus route time. Since the Digital Bus Stop and the transit agency are linked, the screen recognizes up-to-the-second changes. If there’s a route delay or change, riders will see instant updates on the screen. There’s also a cognitive benefit, Wood believes. Wood’s Digital Bus Stop can be found all over the U.S. CHK is partnering with transit and government agencies around the country, including Washington D.C., New York, Chicago, San Antonio and in the Silicon Valley. More are along the way, Wood said. CHK is at the forefront of transit technology, with a small, but mighty group behind it. The company has 20 employees in Santa Barbara, Ventura, San Jose, Las Vegas, Pittsburgh and Toronto. It subcontracts with about 50 programmers and has a research and development building in Ventura. “We are the pioneers of this technology,” Wood said. Like a lot of tech companies, CHK America has successfully pivoted at the right time. Wood founded Santa Barbara-based Maps.com, but then walked away when the British company Cook Hammond & Kell Group, which designed signage for the London Underground, approached him about expanding into the U.S. CHK America has rapidly expanded throughout the states and created the biggest solar-powered bus kiosk system in the nation in Fort Worth, Texas. The company currently plans to replace all 6,000 transit kiosks in Pittsburgh. Its biggest success so far has been the Interactive Kiosk, a screen that allows users to select which buses or trains to take, see if they are running on schedule and glimpse what other places or stops are nearby. 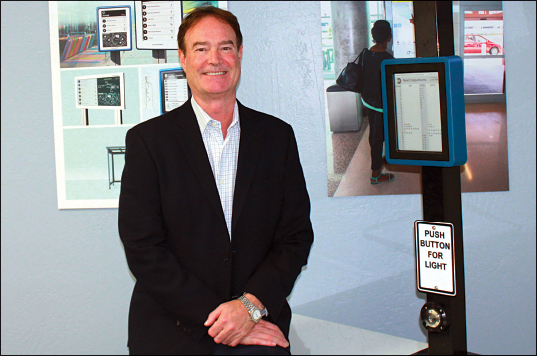 Wood hopes to take his technology beyond transit. There are so many possibilities. “Any industry that offers information that is constantly changing, you can only imagine,” Wood said.